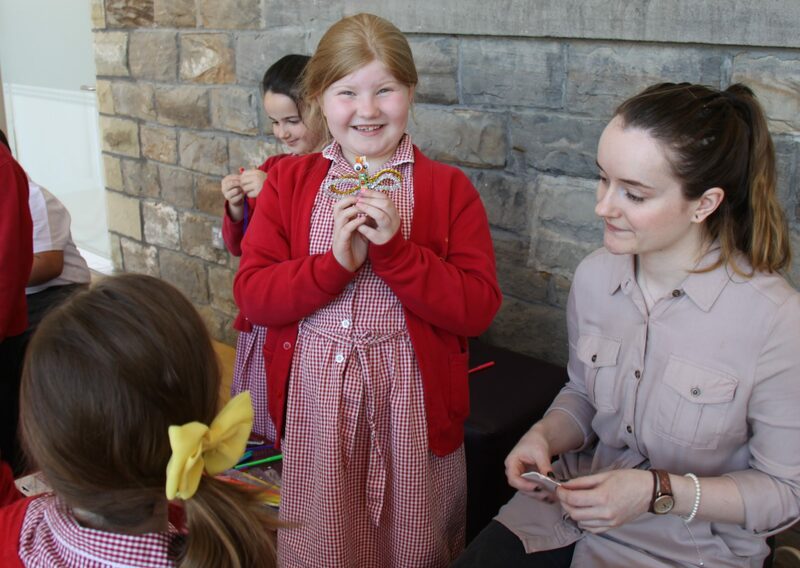 Brierley Church of England Primary became the first Artsmark school in Barnsley in 2015. As part of their journey they embarked upon an exciting project with The Civic that brought about new ideas and experiences for their young people and staff as well as helping them to use Artsmark as a catalyst for positive change at school. Written by Steph Brocken. The impact of Artsmark on wider school improvement and development. The value of building partnerships organically. The value of cultural partnerships to a school undertaking their Artsmark journey. In their Artsmark case study, Brierley School highlighted the significance of their work with The Civic as a catalyst for their successful achievement of the award. Both Brierley and The Civic have particularly expressed the success of this project in terms of its ‘organic’ nature, developing through conversation and in a stage-by-stage process through different elements of engagement. They have also stressed the importance of the sense of equality between the partners in achieving their own aims and objectives. There were two key partners involved in this project. Brierley Church of England Primary School is situated seven miles to the north of Barnsley town centre and was rated Outstanding by Ofsted in 2014. They elected to start working towards Artsmark as a tool to improve provision in school, specifically focusing on improving the range and depth of provision as well as engaging other providers. The cultural partners were The Civic which, after a large regeneration programme in the early 2000s, sits at the heart of Barnsley offering a wide-ranging combined arts programme including theatre, dance, music and visual arts as well as a thriving programme for children and young people. In March 2015, Brierley School brought their whole school to see a show at the Civic called ‘Nicobobinous’. The children enjoyed the show and the chance to visit a theatre space and the staff at the Civic were impressed with the behaviour and enthusiasm of the children that they were invited to come back and take part in a ‘secret’ backstage tour. After the initial visit went down so well with the children, The Civic invited Brierley to bring a group of children along to a backstage tour of the venue. 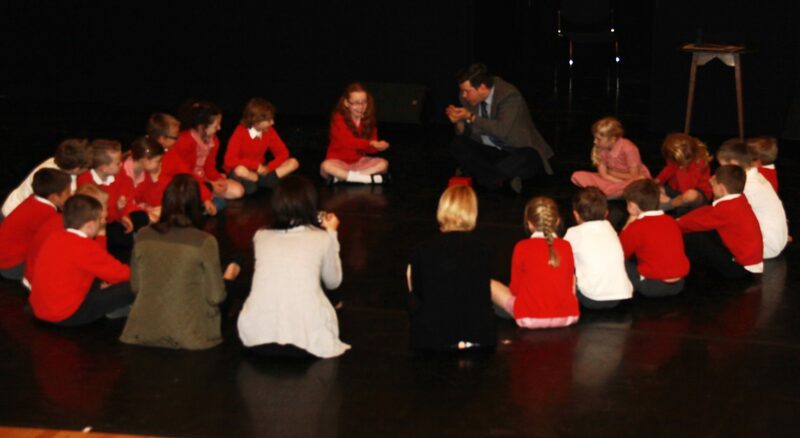 This day was attended by Year 3 pupils from the school and enabled them to see the workings of the venue and to take part in interactive and practical activities that were led by specialist staff to help show them the breadth of work that takes place within the building including drama, music and arts and crafts activities. Staff from Brierley praised the staff at the Civic for being so welcoming and inclusive in their work with the children, several of whom had a range of Special Educational Needs and challenging behaviour. 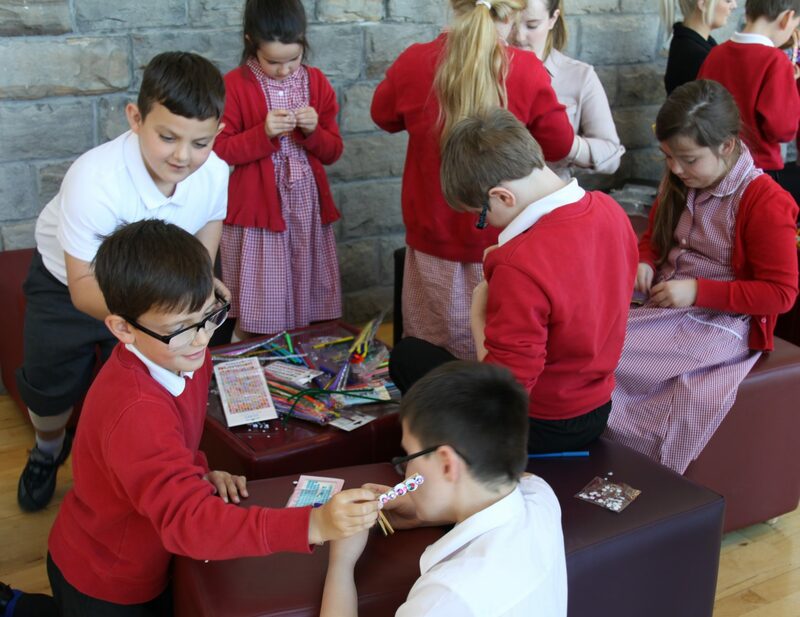 After the success of this day, the school were invited by the Civic to create their own pieces of artwork connected to the upcoming ‘Pirates, Pants and Wellyphants’ exhibition, a retrospective of the artwork of illustrator Nick Sharratt. The children were given a brief to help guide their artwork and the final pieces were exhibited in frames provided by the Civic on the Staircase Gallery. They were then given the exciting news that the exhibition was going to be opened by Nick Sharratt himself and that he would be choosing a winning piece of artwork. The exhibition of young people’s work opened on the same day at the main exhibition with an opening event where the children and their families were invited to come along, meet Nick, have books signed and see the main exhibition of Nick’s work for themselves. Nick was asked to select a winner from the artwork but the quality was so great that he couldn’t make a choice so decided to award the whole class as winners, for which they were rewarded with a chance to come back to the Civic for another Theatre production. After the event, Chief Executive Helen Ball visited Brierley and the children were presented with an individual goodie bag. 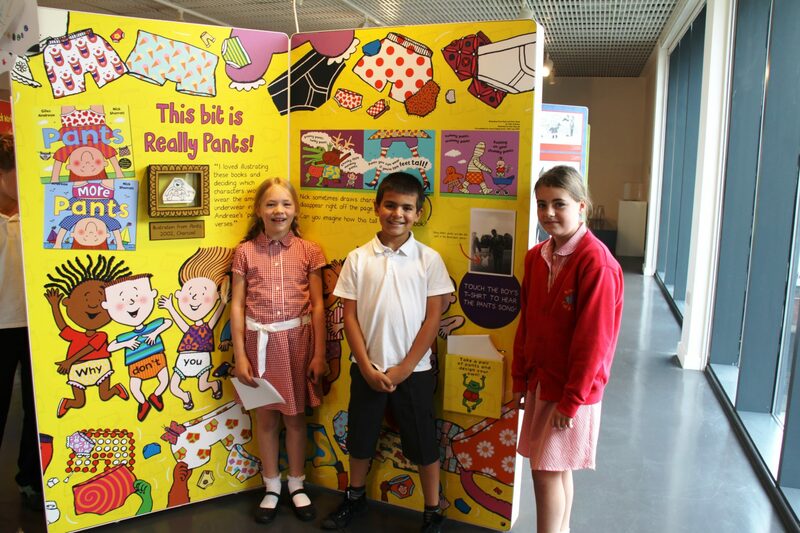 “Class CH went on a tour of The Civic and enjoyed exploring the Nick Sharratt exhibition, Pirates, Pants and Wellyphants. We had an amazing time! Also you can draw like him, dress like the characters in his books and just in case you get sleepy you can always take a nap on the bean bags! Brierley are also using their networks to pass on the expertise that they have gained through their Artsmark process. They are part of a local collaboration network and a Diocesan group of schools with whom they have been able to share knowledge and best practice. This is a great example of how the Artsmark journey of one school can positively benefit other schools working in partnership. The Home/ School Relationship. At the conclusion of the Civic project, parents and children were invited to come to the venue on a Saturday to take part in the official opening of the exhibitions. Twenty children and families attended this event which, for Brierley School, demonstrated a major impact with children and families who may not have engaged with culture before, travelling into the centre of town to visit the venue. This went on to further influence engagement with parents at school through the hosting of more events that bring parents and the community into school. More opportunities have also been offered for parents to come and support the children in their learning and even to pass on some of their own skills and expertise. This highlights that the celebratory element of this project helped to break down the barriers between parents and school. 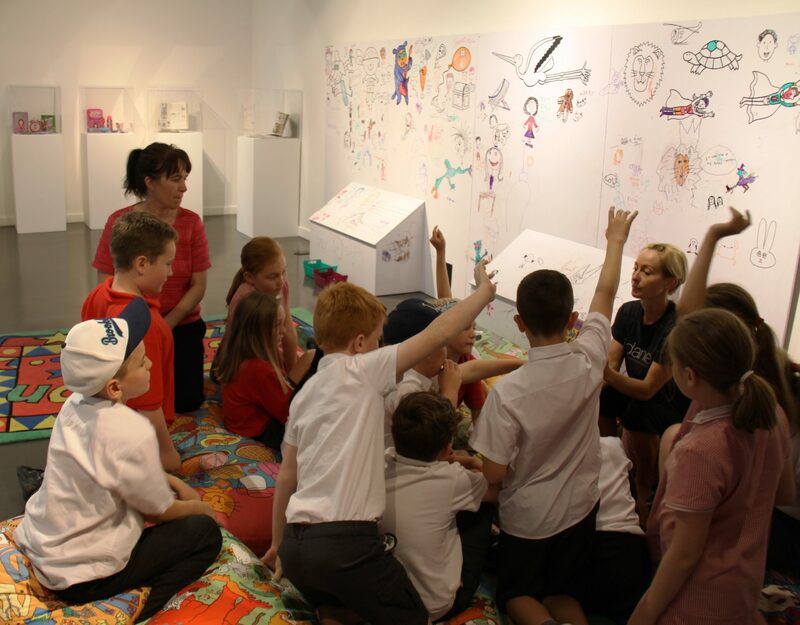 The Artsmark journey has helped to open up the school walls to become a more open environment for parents to share achievements and get involved in their children’s learning on a deeper level. This heightened engagement of those outside the boundaries of the school helped to support the achievement of the Quality Principle of “Being Authentic” through creating links with their real lives. Brierley achieved their Artsmark status and have continued to look for ways to develop their cultural offer through partnerships. Their arts provision in school currently involves a thriving after-school programme including drama, dance and a film club as well as a wide and thoroughly embedded arts curriculum that is well communicated to parents. They are committed to the notion of ‘Learning through first-hand experience’ and place a great deal of value on visits out of school and bringing professionals into school to share their knowledge and expertise. They are currently on the look-out for more new cultural providers to come into school to help combat the, often prohibitive, expense of transporting the children to outside venues. The Civic has a thriving and diverse programme of children’s theatre and a wide variety of schools activity including workshops, exhibition and theatre tours and performances. They have also joined up with the Artsmark partnership programme to advertise the support that they can offer to schools embarking upon this journey and try and support more schools like Brierley on their journey. For more information on how Artsmark can improve the quality of arts provision in your school please visit our Artsmark page.